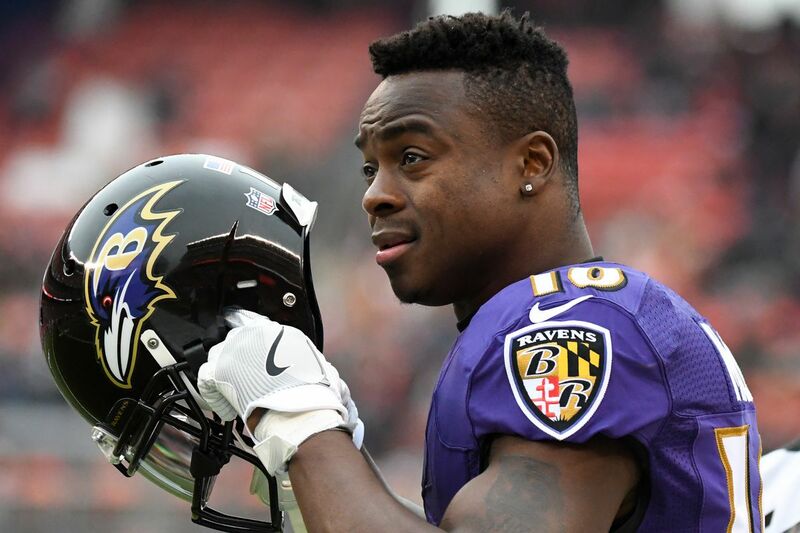 Today, the Baltimore Ravens announced that the team is moving on from veteran wide receiver Jeremy Maclin. Maclin, 29, had a very disappointing season in 2017. The Ravens signed him during the late stages of the offseason after Kansas City unexpectedly cut him. Maclin was expected to be the savior to the Baltimore Ravens lackluster receiving corps. Instead, he only added to its spectacular underperformance. Maclin caught just 40 of his 72 targets and looked nothing during his prime years. Maclin was often injured as well. Overall, the 2017 campaign for Jeremy Maclin was definitely one to forget. By moving on from Maclin, the Baltimore Ravens gained $5 million in cap space. Much of this new wiggle room was used to sign both receivers John Brown and Ryan Grant. Both Brown and Grant agreed to terms with the Ravens last night. Brown was signed to a 1 year, $5 million deal, with an additional $1.5 million in incentives. Brown is a speedy receiver, who’s best season in 2015 yielded over 1,000 yards and seven touchdowns. Grant agreed to terms for a more lucrative deal. Grant, the former Redskins receiver agreed to a 4 year, $29 million deal, with $14.5 million guaranteed. It’s a high price to pay for a slot receiver who’s best season came last year. In 2017, Grant posted 573 yards and four touchdowns. In moving on from Maclin, the Ravens are attempting to revitalize the passing game, which was largely absent for much of the 2017 season. Aside from Mike Wallace, Benjamin Watson, and at times Chris Moore, the Ravens had no dependable receivers. Joe Flacco has had virtually no weapons for the past few seasons, and the Ravens offense struggled because of it. Mike Wallace remains on the free agent market, but that may be soon to change. The Ravens may try to re-sign the veteran wide receiver, or he may find another deal elsewhere. Other receiving options, such as former Saints wide receiver Brandon Coleman, former Lions tight end Eric Ebron, and former Dolphins tight end Julius Thomas, are also available. Previous Previous post: Baltimore Ravens to sign John Brown.